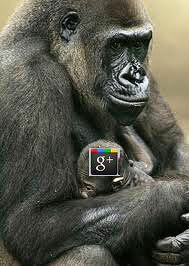 Google is the 800-pound gorilla of the Internet. Google+ is its baby. You better pay attention. July 2011 - Bloggers at seomoz.org started experimenting with the visibility of links added from a Google+ profile. Results were inconclusive. Nov. 26, 2012 from dummies.com.
" 'That being said, Kamdar stressed that while Authorship is not an algorithmic factor, it is a strong contribution to their social signals that are used to weight search results, including social activity outside of Google+. “We’re working on a number of signals to identify high quality authors,' he says." How to Do It - You can link Website content, articles, and blog posts to your Google+ profile.